LOTTE Co., Ltd., is one of the very famous Japanese confectionery makers and selling more than 200 of their products such as ‘Koala's March’, ‘Ghana Chocolate’, ‘Choco Pie’, ‘Toppo’, to more than 70 countries. The company has the overseas corporate group in 6 countries of Thailand, Indonesia, Vietnam, Taiwan, Malaysia, Philippines and one of them is LOTTE CONFECTIONERY PILIPPINAS CORPORATION (LOTTE PILIPPINAS). LOTTE PILIPPINAS was established as a role of sales company of LOTTE products to Philippines in 2009. Since then, they have been steadily expanding its sales in Philippines. We interviewed Mr. MACHIUR, National Sales & Marketing Manager of LOTTE PILIPINAS to approach the charm of LOTTE products and the trend of the company in the Philippine market. There are two types of "chocolate confectionery", one is pure "chocolate confectionery" containing many cacao mass and cacao butter as the main raw material of the chocolate and the other is "chocolate flavored confectionery" which is containing vegetable fats and oils in place of pure cacao ingredients. Because cacao materials are expensive, most of the products in Philippines are "chocolate flavored confectionery’’ which are provided at a lower price. On the other hand, LOTTE chocolate products are "chocolate confectionery" containing enough cacao ingredients. They sell this type of the premium chocolate with quality ingredients in Philippines. LOTTE is very famous in Japan and its brand are well recognized for its catchphrase, "Lover of your mouth". However, LOTTE's reputation in Philippines is not yet high in Philippines, and "chocolate-flavored confectionery" is obviously popular in Philippines at present. LOTTE PILIPPINAS performs the reputation improvement by steady activity for the development of "chocolate confectionery" which is the premium chocolate. For example, they distribute products samples in front of office buildings where their product targets are working.By distributing the samples, the company have opportunities that their targets can taste of their premium chocolate products. 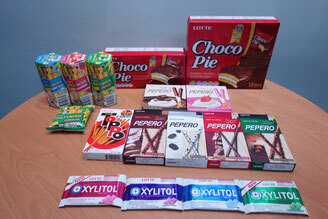 Through these steady activities, the brand recognition rate of "PEPERO", which is one of the representative products of LOTTE PILIPPINAS, reached about 80%. ※Recognition rate: Percentage of the number of people knowing the specified product name. The process of increasing the recognition rate and promoting premium chocolate products is the accumulation of steady efforts. There are different backgrounds in business custom between the one in Japan and Philippines. To adapt to such business custom, product makers often choose to collaborate with the distributors who are familiar with the business field. However, LOTTE PILIPPINAS took the strategy to conduct the direct marketing activities by themselves. It is to keep the goods quality and the sales promotion activities under their direct control. Tackling the sales promotion activities by their company means that they also need to manage the shelves of LOTTE in more than 6,000 retail stores by themselves. First, they hired about 400 store round staffs called merchandisers, and thoroughly manage the store shelves on which LOTTE products are displayed at the supermarkets and the convenience stores. Considering the customer's eye level, sales staff teaches the sales and promotion know-how and the techniques aggregated by LOTTE to the merchandisers. The merchandisers performance is supervised and improved by LOTTE PILIPPINAS sales staff. This is how they carry out their promotion strategy and realize to keep shops that customers actually buy LOTTE products. Idea of returning product is also greatly different between Japan and Philippines. Because it is unable to count the returning products due to the circumstances of the materials flow, the bills from store with the returning products was the only way to know the actual returning product number. In addition, there are many cases that products are lost in stores, in transportation, in warehouse, but the tracking is impossible substantially. The ratio of returned unsold goods in Philippines was 16% in 2012, when Mr. Machiura started working in LOTTE PHILIPINES, and comparing to the average ratio in Japan, it was significantly high. Currently it has improved to 5% by organizing the business flow and utilizing the data. However, they had other problems too. In order to check the condition of product shelf, the sales staff of LOTTE PILIPPINAS had to go around each shop. 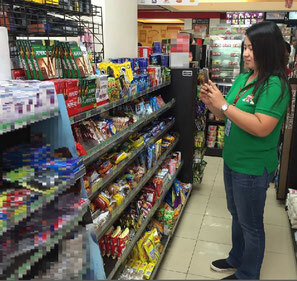 It is important how to efficiently manage the sales to the venders reaching 6,000 stores in Philippines, which is said to have more than 7,000 islands in large or small. The headquarters received the report weekly, but it was too late in the weekly report to catch the trend of the market quickly. Since the method of reporting was also the submission of the documents, the headquarters manager was in the situation that they could not confirm them from outside the company. They have decided to introduce kintone to improve the situation like this. "With the introduction of kintone, the date is more fresh now. Because we can receive round-sales reports within the day when sales staff visit stores and check product shelves, we can know the real-time situation," Mr. Machiura says. With the introduction of kintone, managers have gotten to be able to receive the reports daily basis. This reporting method through kintone also reduced the workload and mitigated the stress of the sales members who manage many stores at the same time. 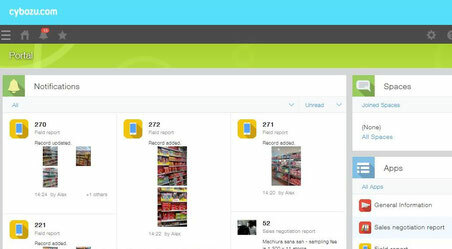 The data comparison of each store became easy by using the unified format of kintone. It is said that it is very useful because the communication between the person in charge and the manager can be made without the discordance by taking the pictures of the display shelf and uploading it to the kintone and sharing it inside the company. In addition, in preparation for quitting the job of the merchandiser, we set the rules that merchandisers must leave the conversation record exchanged to the buyers on kintone. Previously, we let them write the exchanging phone calls to the manuscript, print and submit it, but we were worried about changing the situation and time lag. transferred to kintone, we received the reports on the following day if not sooner. The value of information significantly improved comparing to before. We plan to use in cooperation with the schedule management and the map function and to utilize more in the future. "Not the brand recognition rate, we would like to raise consumers’ ‘mindshare rate’ ", Mr. Machiura says about the LOTTE PILIPPINAS market strategy. The brand mindshare is the index to measure whether the company or product is deeply penetrated to consumers as a representative brand of each category. LOTTE 's brand recognition rate has been increased, but the brand mindshare rate is still not high for them. It is also steadily growing. By progressing the steady business development from now on, LOTTE's "chocolate confectionery" will become common in Philippines as well as in Japan. In the near future, everyone will answer ’LOTTE ! ’ to the question asking what they would come up in their mind when they hear the word ‘chocolate’.